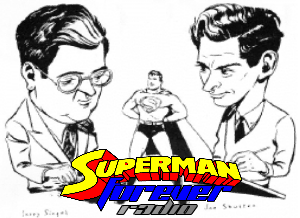 This week, we look into Superman‘s origin much deeper- by looking at his creators, Jerry Siegel and Joe Shuster in part one of a three part series on the creation of Superman. In the midst of the Great Depression, two outcast teenagers would meet and form a bond that would last a lifetime- and create the world’s first Super-hero. I count down the top 5 Superman books that mean the most to me, and answer a quick e-mail. We also look at the Superman books for June 2006- Superman #651, Action Comics #838, and Superman/Batman #26 (It’s a tear-jerker). Hi, I have decided to go back from the beginning and listen to your podcasts. However, I’ve noticed that the last two episode were a little bit short or cut off early. I was wondering if there was a reason why. I realize that you are taking a break from ithis podcast, but if you have any information that’d be great, thanks again for a great show. Which episodes cut-off? I can re-upload them to make sure they play all the way through. It’s episodes 6 and 7. Both seem to end around the 25th minute, in the middle of a rereview.